On my way to work today, I stopped at PetSmart to get a replacement bulb for Moses’ heat lamp. 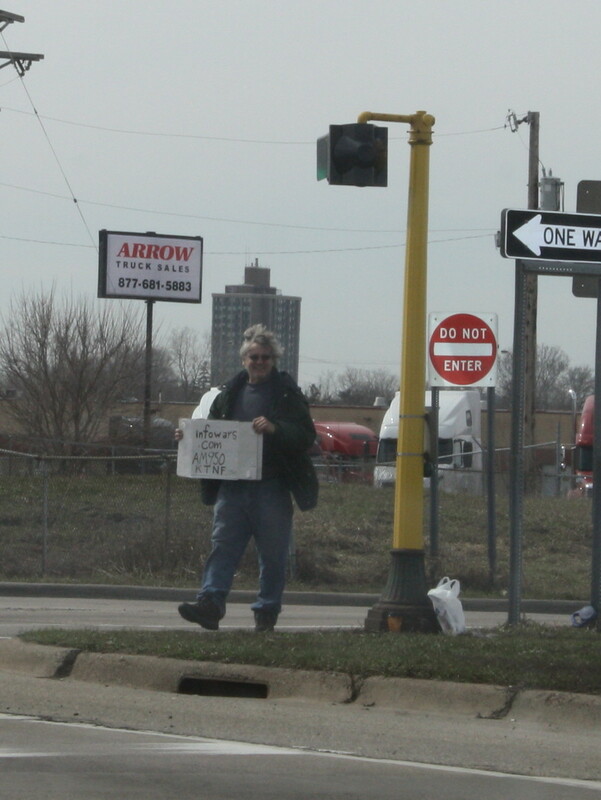 While waiting at the light, I saw this guy with a cardboard sign standing on the side of the road. As a resident of the hood, I’m used to seeing guys with cardboard signs at the end of highway exits and entrances. I made sure my doors were locked. And then my eyes focused in on what his sign said. He was advertising for Alex Jones! Whose name and website I’m well aware of lately. I confess, I didn’t tune into the radio show as I really needed to focus my mind on Christ at that particular time. Nor have I ever voluntarily tuned in to his radio show. (Okay, maybe once, but there were pancakes involved.) However, after tasting and smelling a difference in the city water this week, I’m starting to think maybe Alex Jones knows a thing or two. And you better believe I stopped next door at Target to buy a case of bottled water. Wake up America! Prisonplanet.com & Infowars.com to stream the “Alex Jones Radio Show” free 24/7 or live 11am-3pm CST! The church can’t be a prophetic entity in the earth if she doesn’t know her signs and times! BECAUSE THERE’S A WAR ON YOUR MIND!! Just know that ultimately we can trust in CHRIST! He’s our only hope. Get on the Ark before it’s too late! I don’t listen to the radio…well, at all, pretty much. But I do like Alex Jones (I’ll read his website and catch clips on YouTube) and I agree that he “knows a thing or two.” I read other blogs, sites, etc. that publish along a similar vein. Although I’m not quite as enthusiastic as the above commenter. That is high treason against this REPUBLIC!!!!!!!! I just want to warn people of the demonic world they are entrenched in! They are poisoning your water supply with fluoride and other chemicals, the factory made flu vaccines had mercury in them, which has caused autism in the past, GMO vegetables are sterilizing people, planes above are spraying chem trails on people!!! CPS wants to own your kids, home schooling is illegal in California, FEMA is setting up concentration camps for dissident citizens who don’t comply with Martial Law, they’re disarming society by banning guns and removing the 2nd amendment, their taxing us into oblivion to fund 3rd world wars in order to advance their eugenics movement and depopulate the earth, the carbon tax/global warming is a fraud to scare the people and get more of their money, their installing remote thermostats so the government can control your utilities, its North Korea, or Nazi Germany all over again! Down! Down, boy! I think she’s on your team.